What makes the English English? Is it their eccentricity, their passionate love (or, indeed, hatred) of Marmite – or is it something less easily defined? Beginning at the top of a muddy Gloucestershire slope at the Coopers Hill cheese-rolling contest and traversing a landscape of lawns and queues, coastlines and sporting arenas, Ben Fogle takes us on a journey through the peculiarly English: a country of wax jackets, cricket, boat races and jellied eels, by way of national treasures such as the shipping forecast, fish and chips and the Wellington boot. Not to mention the Dunkirk spirit of relentless optimism in the face of adversity, be it the heroic failure of Captain Scott’s doomed Antarctic expedition, or simply the perennial hope for better weather. The archetypal Englishman – lover of labradors and Land Rovers yet holder of two passports – Ben applauds all things quintessentially English while also paying tribute to the history, culture and ideas adopted with such gusto that they have become part of the fabric of the country. 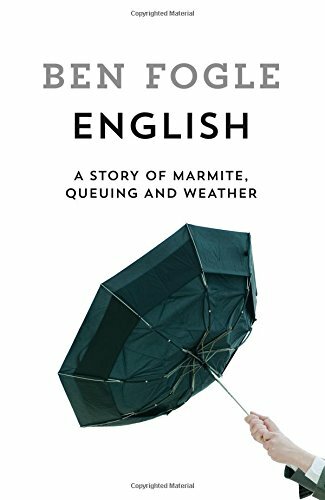 Written with Ben’s trademark warmth and wit, this is a light-hearted yet touching tribute to all things English. I won a copy of English by Ben Fogle on Twitter and have to admit to being slightly underwhelmed by the cover. Although the English do love talking about the weather, there's nothing worse than getting soaked when a force 10 gale blows our brolly inside out on a wet weekend but it actually does typify the English so, in hindsight I did find it a good choice of cover image. So I went into the book thinking: 'What could this half-Canadian tell me about my own country?' The answer: quite a blooming lot actually. I not only learned new things, but I remembered things I had forgotten and had a good laugh along the way. 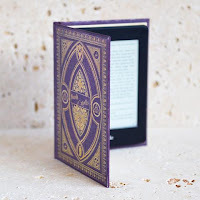 I loved the way English is written; I felt as if Ben Fogle was talking solely to me and I think, as Ben is a natural presenter, some of the subjects would make good TV viewing. Of course you couldn't start a book about the English without talking about the weather and English has a whole chapter relating to our favourite subject, not just a chapter but the honour of the opening chapter. (It's cold and damp here in North East England, in case you were wondering). It was this chapter that first made me sit up and take notice as I read about Captain Gladstone Adams travelling back to Newcastle in 1908 after seeing the Mags losing to Wolves in the FA Cup Final (ha ha). It was snowing so heavily on 25 April 1908 that Captain Adams had to keep stopping to clear his car windscreen and decided to invent mechanical windscreen wipers. Who knew? The North East gets quite a good few mentions in English, which makes quite a change as we are normally forgotten. Apart from the windscreen wiper inventing Newcastle fan, there are also good mentions for the Barbour factory in South Tyneside, the Alnwick Shrove Tuesday football match and the Hartlepool monkey. I learnt so much in this book, not only about what makes us English, but about things that had previously been a mystery to me. For example, why do some people call their evening meal 'tea' and what is the origin of taking someone down a peg or two? Answers to these questions and SO much more are in this amazing book. I don't want to share too much of my (many) favourite parts of this book, but I just have to quote a passage from English that anyone who has been to Betty's tearooms will understand. Only the English would happily queue for tea. Just reading it back here is music to my ears! A queue for tea? Where do I sign up? The tea queue stretched around the corner. Can there be two more beautiful words to the English ear than 'tea' and 'queue'? Ben Fogle may be half Canadian but he sure knows a thing or two about the English and is sure to raise an eyebrow or two in this excellent book. This book should be given to everyone applying for British citizenship to let them know what they are letting themselves in for; you can't revise for this test, Englishness is either in you or it isn't. A highly recommended book for non-fiction fans who think they know everything about English history, you ain't read nothin' yet!